Dr. Lina Policarpio is a veterinarian by profession and is currently the Head of Technical Services for ASEAN of Elanco Animal Health. She has held various commercial and technical roles in her 26 years with the company. 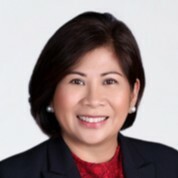 She actively participates in industry events and was also a former President of the Philippine College of Poultry Practitioners.